That photo was taken when I was… oh, around 3 years old I think? I can’t really remember. All I can recall is that my bowtie squeaked when you squeezed it. 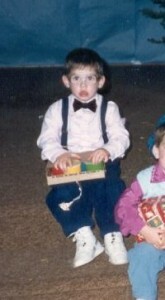 As adorable as I was in my pink dress shirt and navy blue suspenders, I still had several problems. I wore bifocals since I fought my way out of the womb due to an astigmatism in 1 of my eyes. And, of course, I had the infamous class 3 occlusion. What a treasure I must have been–a newborn with old-man eyes and a botched face! My parents were so proud. I spent some time with a friend the other day who underwent lower jaw surgery over Christmas of last year. It’s been approximately 3 and a half months since his operation. He looks great, his face is a lot “fuller”, his side profile makes sense now, and he said he’d do it all over again without hesitation. I appreciated his enthusiasm toward his results. Even though recovery is terribly taxing, I guess it will be something I’m glad I went through when I get to see the final product! Several people from my office walk to a nearby park for lunch on days when it’s warm out. Being in northern Alberta, we generally only get 2-3 months worth of these nice days per year, so we must take full advantage of each and every moment when they do show up. About 10 of us gathered around a picnic table and had a great time. My jaw is hurting a little bit from talking so much though, and my stomach is hurting from having to watch everybody eat their delicious subs and donairs. Let me take a moment to tell you about the Donair Nazi. He’s similar to the Soup Nazi from Seinfeld in that, when you walk into his shop, he tells you what you’re having for lunch (and not the other way around). I’ve heard many horror stories about people who asked for certain ingredients in their donair, only to be laughed out of the place. In fact, he has a mouse trap set up on the counter with a note on it that says, “For customer service, press here.” His wrath is worth it though, because the donairs he makes are to die for. I had the privilege of slicing my finger open while cutting up strawberries for my smoothie last night. I’ve since learned that moving a knife through a soft piece of fruit and using your other hand as the cutting board is a bad idea. The kitchen never was my forte. 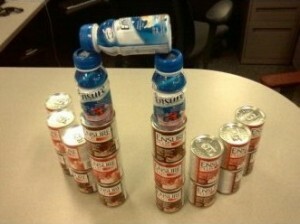 I leave you with a picture of one of the amazing feats I’ve accomplished at work thus far. Don’t get the wrong idea–I’m actually incredibly productive here. But sometimes your brain needs a rest, and while some people choose to go refill their coffee and others decide to hang out around the water cooler, I construct massive fortresses out of everyday materials. I figure that if I drink 3 cans of Ensure per day for 5 days each week, and I’m on a liquid diet for another 4 weeks, that’s 60 empty cans I’ll have at my disposal by the time I’m finished. Considering my current fortress is built from only 21 cans, I should end up with a structure 3x this size. Thanks Graham. My surgeon didn’t say I could take them off to eat but I will be asking him if that would be ok, at least while I try to eat! So it’s day 25 post-op…my how time flies! I had an appt with my surgeon yesterday. He put new elastics on and he wants them changed every three days. My daughter who is a certified dental assistant is going to change them for me and show me which teeth to hook them on,( unfortunately she is moving away at the end of the week). I was given the go ahead to eat soft foods so I made mashed potatoes. What a chore to try to eat. It took me 45 mins to eat a small bowl. I had to use a baby spoon, and turn it upside down to get it in my mouth. I’m almost thinking making and drinking smoothies is easier! I’m going to try some scrambled eggs today. Graham, how long did you have to wear your elastics? I’m afraid while I have to wear them that trying to eat soft foods is just not worth it. Keep in mind, dear Emily, that the “3 cans per day” rule is only applied at work. I was also drinking a few outside of working hours for breakfast and dinner. Cheers to never drinking Ensure again! I like your fortress. But only three a day? I’ve consumed four today and I’m debating a fifth. My tummy is growling! Normally I’m not so insane with the Ensure but I got new elastics today on my front teeth, and it’s kinda a pain getting in food now! When all else fails…Ensure wins. I know! Those videos are so gross! Am happier with your blog, a guy posted of vide of his surgery on Youtube, i watched the first 10 secs as i was curious to know how these doctors handled my jaws and chin during 8 hours. I could not watch more than that. Yeah, but then you’d be like our teenage jaw counterparts. The younger ones tend to YouTube their experience. The older ones start blogs. Again, this feat should be YouTubed. 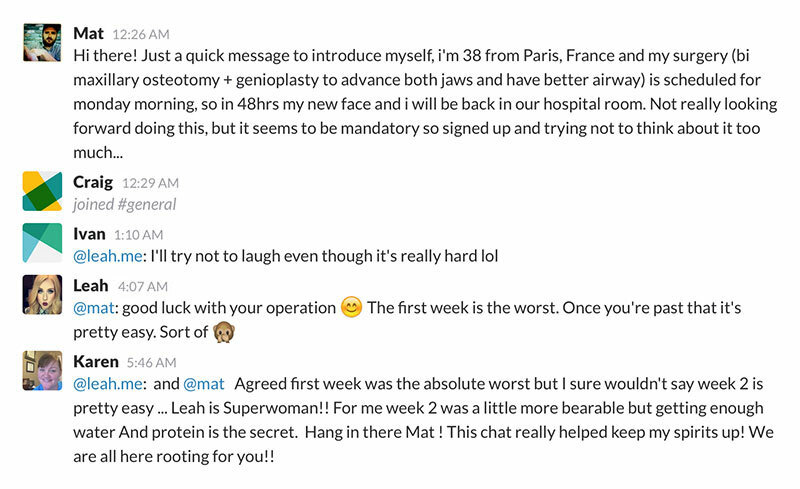 Haha, perhaps I should become a jaw surgery sales guy? Graham I am sure that this surgery is worse then you make it sound, but you are having so much fun with it I kind of what to do it now. Your perspective is so positive and refreshing, good work.